Suraj Singh of Bangalore created the “Adopt a Road Project” in his Self-Expression and Leadership Program, as a means of making a difference in his community by improving road quality throughout the Indian metropolis, using a variety of methods. Singh created Good Life Traffic Solutions, whose offical purpose is “to reduce the congestion of traffic and ensure smooth flow of vehicles on the road.” The India Times recently wrote an article about the work being done. Bangalore: On Sunday, residents of Marathahalli and Whitfield will see youths dressed in blue jeans and white T-shirts correcting the medians, removing stones and garbage and appreciating the efforts of the traffic cops and Home Guards. Two Sundays ago, they did this on Hosur Road, Bannerghatta Road, Trinity Circle and Intermediate Ring Road. 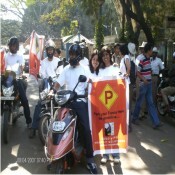 These volunteers of Good Life Traffic Solutions (GLTS) have a singular vision – eliminate traffic woes in Bangalore. These young professionals and students believe their effort will help Bangaloreans. They don’t depend on the authorities to fund their efforts and have pooled in RS 8,000 to take care of expenses. On Hosur Road, the volunteers cleared garbage near Army School and later removed unwanted stones, corrected medians and median blockers which had been scattered. They fixed medians, realigned them and filled in missing sections. On Bannerghatta Road, they removed big slabs of stones on the road and covered two gaps created in the median by two-wheeler riders. They covered it using extra slabs. They did similar work on Intermediate Ring Road, Trinity Circle, CMH Road and Indiranagar 100 Feet Road. “Our objective is to reduce traffic congestion and ensure smoth flow of vehicles on the road. We aim at making Bangalore a commuter-friendly city,” said Suraj Singh G of GLTS. They have several plans for this. Fill potholes on all busy roads; provide a website with road map, alternative routes, live feed updates about traffic density, give a toll-free number to help stranded commuters; help maintain lane discipline at busy places like temples, schools, hospitals and provide Home Guards controlling traffic with appropriate accessories like gloves, jackets, boots, etc. The toll-free number is to provide services like immediate evacuation, mechanical assistance, first aid and route guidance to a stranded commuter who is lost or late for work in the event of broken down vehicle or health-related emergencies on the road. City additional commissioner (traffic and security) KC Ramamurthy is all praise for their efforts. He said he’s extend all possible help to honour their work and agreed to train them to help traffic policemen at traffic jams. yup i do agree that Bangalore has lost its charm, n no more the GARDEN CITY instead its polluted n crowded city……..i think the infrastructure which is still not planned……..n there r no strict restictions being made against building byelaws….n the metro whichz still d question…..n pity the ruleng govt. which receives no funds r support frm central.